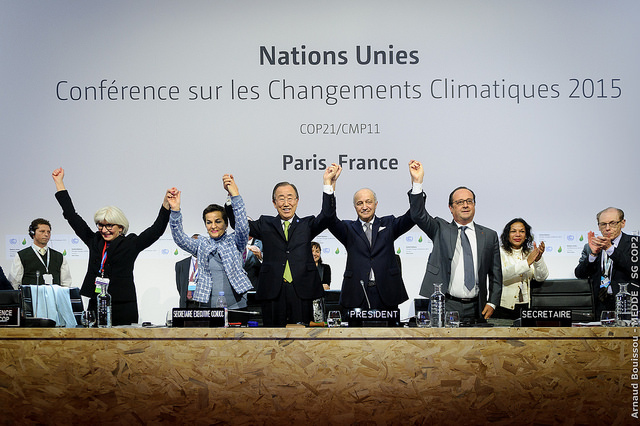 Le Bourget, Paris – 12 December 2015: The Climate Vulnerable Forum (CVF) marked the adoption of the Paris Agreement at the 21st Conference of the Parties of the UNFCCC (COP21) as a historic step forward for a climate-safe future and a major victory for the vulnerable countries in the negotiations. “In COP21 we made 1.5 define global ambition. Paris has given us 1.5 to survive and thrive. It’s now up to us all to bring that vision into reality. The CVF will continue to lead and sustain the fight against climate change and to secure a safe and resilient future for all,” De Guzman concluded. Welcomed the historic agreement of the world’s nations to limit future warming to a minimum by deciding to pursue efforts to achieve a 1.5°C limit to temperature increases and a long-term mitigation target consistent with 1.5°C. Cautioned that the mitigation target in the Paris Agreement (article 4) would need to be achieved close to mid-century in order to comply with the 1.5°C limit, and so will require continued concerted efforts by all parties to take early and upscaled climate action. Welcomed the establishment of a stock take review towards achievement of the Long-Term Goal in 2018, and 5-year review cycles where all countries need to do more than previous commitments, which represents a robust framework for progressively moving towards compliance with the 1.5°C regime. Welcomed the inclusion of strong human rights language underpinning the regime in the COP21 agreement preambles and the first recognition of “Climate Justice” in an international agreement as a testament to the global community’s resolve to upholding fundamental human rights in delivering climate action. Expressed appreciation for the commitment of developed countries to provide scaled-up finance and welcomes the decision to set a new post-2020 joint finance target for developed countries consistent with the needs of developing countries and the low-emission and climate-resilient development goals of the Agreement, including building from a floor of $100 billion per year. The Forum continues to urge achievement of a balance in flows between adaptation and mitigation, a provision in the new agreement, by 2020 at the latest. Strongly welcomed the recognition of loss and damage as a core element of the Paris Agreement and the confirmation of the Warsaw International Mechanism under the new regime together with agreed steps towards its strengthening and enhancement for averting, minimizing and addressing climate change loss and damage. The CVF confirmed the following 43 nations as member states in the Forum, which represents one billion vulnerable people worldwide: Afghanistan, Bangladesh, Barbados, Bhutan, Burkina Faso, Cambodia, Comoros, Costa Rica, Dominican Republic, Democratic Republic of Congo, Ethiopia, Fiji, Ghana, Grenada, Guatemala, Haiti, Honduras, Kenya, Kiribati, Madagascar, Malawi, Maldives, Marshall Islands, Mongolia, Morocco, Nepal, Niger, Palau, Papua New Guinea, Philippines, Rwanda, Saint Lucia, Senegal, South Sudan, Sri Lanka, Sudan, Tanzania, Timor-Leste, Tunisia, Tuvalu, Vanuatu, Vietnam, and Yemen. In doing so, 23 new member states were welcomed as participating countries in its dedicated cooperation forum for developing countries vulnerable to climate change. The Forum had spearheaded a public campaign, #1o5C (www.1o5C.org), highlighting the clear majority of UNFCCC parties that supported a 1.5°C goal together with CARE International and the Climate Action Network, and hundreds of civil society organizations calling for the Paris Agreement to enshrine the sensible, evidence-based strengthening of the previous 2 degree temperature goal.